Insurance has been highlighted in the building industry lately with most of the concerns surrounding cladding and other non-conforming building materials. At this stage, building designers remain relatively untouched by the change in the insurance market and continue to have access to insurance policies that meet their registration requirements with the VBA. This hasn’t been the case for other building practitioners, most notably Building Surveyors, Certifiers, Fire Engineers and Architects. These practitioners are traditionally those involved with the design and construction process of high rise buildings, municipal buildings and other ‘at risk’ commercial properties. These practitioners are finding it very difficult to get insurance cover that meets the VBA’s requirements as their policies either have non-conforming building products exclusions or, if they don’t have an exclusion, they have experienced sizable increases in their premiums, with some upwards of 400%. The issues in Australia have been compounded by events occurring in the UK, especially from an insurance point of view. Significant claims have already occurred. 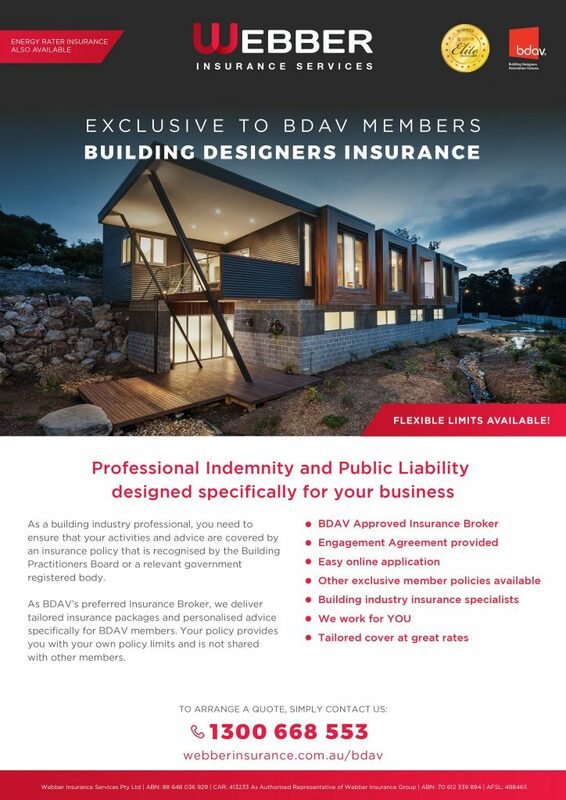 With regard to the BDAV Insurance package, we have worked extremely hard to ensure that the insurance policy remains compliant with VBA requirements and we are pleased to advise that it does not have any exclusions for non-compliant building materials. If they are, we recommend that a desktop assessment is completed by a Building Surveyor as soon as possible. By following these steps, you will have a clearer indication as to whether a claim notification will need to be made on your professional indemnity insurance. The advice we have received, is that if a potential issue has arisen, you are better to make notification now rather than wait for any correspondence to be received. At Webber Insurance, we are closely monitoring the insurance markets, legislative changes and rulings together with other non-conforming building material related issues, both in Australia and abroad. We will continue to keep members up to date and informed on changes that may affect them. Over the past six months, we have been working to improve the BDAV Insurance Program to ensure that it remains the ‘best in market’ for Building Designers. For the first time, we have introduced multiple options of coverage limits to allow members to choose a limit that is suitable to their business. Our premium structure has also changed allowing us to offer extremely competitive premiums for all members. Confidence that your broker knows your industry. However, the best thing is that getting a quote is now simple – it’s all completely electronic and offers you options. If you just want a quick price to see how competitive we are, complete your details HERE via our Quick Quote and we will come straight back to you with a price; it should only take you 30 seconds to complete! If you would like a full written quote, please complete our simple online proposal form HERE. Most quotes will be sent back to you the same day. Our team is here to help. If you have any questions, please feel free to contact us on 1300 668 553; email us at bdav@webberinsurance.com.au or jump online to our website and chat with us via LiveChat. We look forward to helping you this year with your insurance requirements. Chris Webber is the Managing Director of Webber Insurance Services with diplomas of both Insurance Broking and Risk Management. Webber Insurance Services is the approved Insurance Broker of the BDAV. For any enquiries, please call 1300 668 553 or email bdav@webberinsurance.com.au.